Thursday 19th November saw The Modern Law Awards reveal their 2015 award winners at a glittering London ceremony, and Spencers are thrilled to announce that Chief Information Officer Martyn Gilbert walked away with the award for non-lawyer of the year. Both Martyn and Spencers CEO Rob Landman attended the evening's ceremony, which saw a champagne reception and dinner followed by the awards announcements and a night of entertainment. Renowned comedian Jimmy Carr was on hand to host the evening's proceedings, and with sponsor Mark Hartigan of Just Costs presented Martyn with his award. 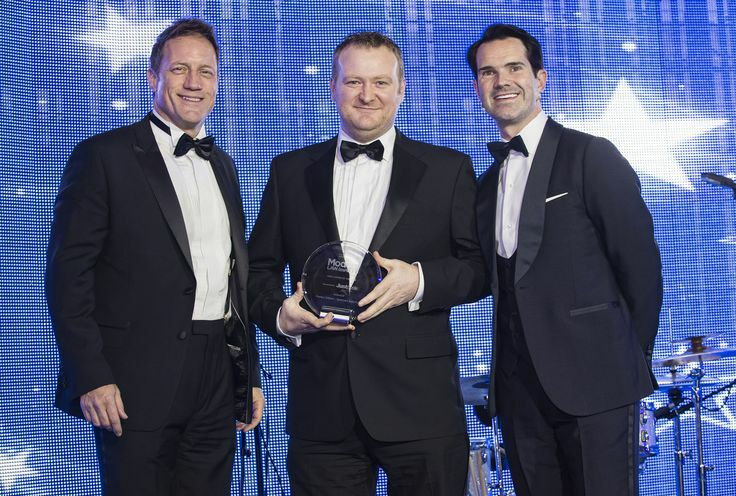 Martyn Gilbert being presented with 'Non Lawyer of the Year' at the Modern Law Awards 2015 by comedian Jimmy Carr and Mark Hartigan of Just Costs Solicitors. The Eclipse Proclaim Modern Law Awards is an annual industry-wide event, which looks to identify and celebrate outstanding talent and success in the modern legal services arena. Martyn has been recognised for his crucial role in driving growth and development within Spencers Solicitors, including his dedication to building legal processes and systems that have enabled the firm to revolutionise client experience. In a difficult personal injury market he has developed unique business processes that have allowed the firm to move away from introducer-fed clients, with 60% of work now generated direct. Through reorienting the practice to offer legal services directly to the public he has developed a strong online presence focusing on providing relevant information to injured people and simplifying the claim process. Along with a 40% rise in online visitors who now make an enquiry, Martyn has also nurtured a strong firm-wide understanding of a client's journey in selecting a legal service provider. "We can think of no one more deserving than Martyn for this award. His role in transforming the way we approach our business, and building the firm to the position it holds today, has been pivotal. His passion and technical leadership benefits and supports both our lawyers and our clients, and he is a driving force in enabling us to go above and beyond in every case we undertake." The awards ceremony took place The Hurlingham Club, London.